So let’s say the habitable-zone exoplanets are terrestrial. Does that mean we could live there? The second thing we need to know is how the brightness of Kepler-452 changes as planet Kepler-452b moves in front of it. Use the plot shown in this exercise box to find this information. 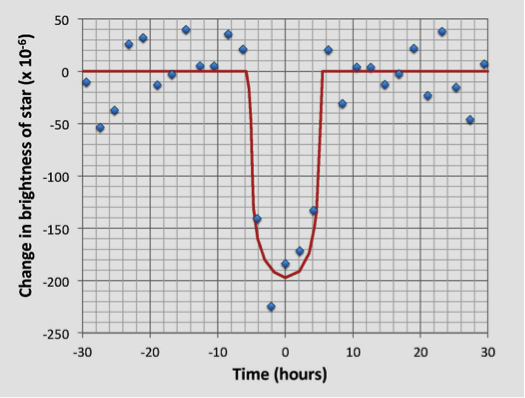 Find the value on the y-axis where the red curve shows the most dimming from the planet and record your result in Table 22.6. 22.5 Are There Other Earths? by Karla Panchuk, Department of Geological Sciences, University of Saskatchewan is licensed under a Creative Commons Attribution 4.0 International License, except where otherwise noted.